This aircraft was delivered to the Central Intelligence Agency at Groom Lake, Nevada, on March 5, 1956, under contract SP-1913 for an approximate cost of $1,000,000.00. It was deployed with Detachment “A” in late April of the same year. With the closure of Detachment “A”, it returned to the United States in November, 1957, and was then transferred to the Strategic Air Command and in particular, the 4028th Strategic Reconnaissance Weather Squadron of the 4080th Strategic Reconnaissance Wing based at Laughlin Air Force Base, Texas. However, it was retained by Lockheed as a test/development aircraft until January, 1959. 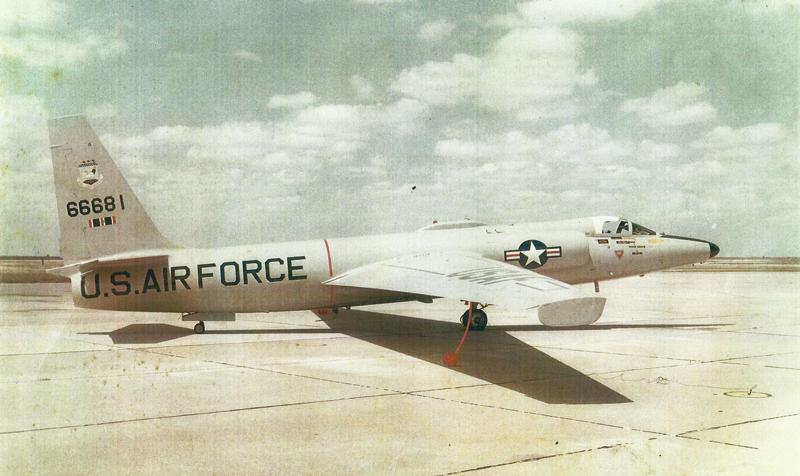 This photo shows the aircraft in the markings as flown at Laughlin Air Force Base on or about the 24th day of November, 1962 (note the Air Force Outstanding Unit Award on the rudder). It was then returned to the Central Intelligence Agency in mid 1963, and was converted by January, 1964, to the “G” model configuration for operations from U.S. Navy Aircraft Carriers. Placed into “flyable storage” at Edwards North Base from 1969 until the spring of 1971, it was then transferred to the NASA and based at the Ames Research Center, Naval Air Station Moffett Field in California. It was operational at that location from June, 1971, until retired in August, 1987, with 10,000 hours on its airframe, and is now displayed at the Ames Research Center. Chris Pocock, 50 Years of the U-2: The Complete Illustrated History of the "Dragon Lady"